In support of the Laurence Aberhart photographic exhibition now on in the Marie King Gallery, Russell Museum staff have been into the storeroom. There we found a variety of unexpected objects which are now on display too. It was sobering to realise that even in the midst of war, individual soldiers found somewhere to stash small reminders, souvenirs of those momentous days, and to bring them home. For us, a century later, they are also reminders of those soldiers. Some of these mementoes came home with Russell men Horace Williams and Len Woods. 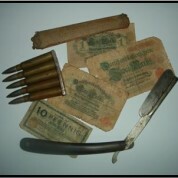 Shown here are German bank notes, Turkish shells, a cut throat razor found in a trench at Gallipoli, and a piece of fabric covered wood which was once part of a German aircraft. Mr Williams saw this aeroplane attack an Allied Observation Balloon. It was one of the first aircraft that NZ troops ever saw. The balloon’s crew returned the attack and each destroyed the other. The aeroplane brought down the balloon, killing all the crew, and then crashed, killing its pilot. It’s a very different, tangible type of memorial to anonymous servicemen from both sides of the conflict.